To an urbanist, the following sets of photos are truly disturbing. I’ve heard it said many times over that Columbus is a new city filled with suburban design, and that it never really had a true urban, historic core. The sad thing is that that is dead wrong, and I say it’s sad because so much of it was lost in the name of progress. 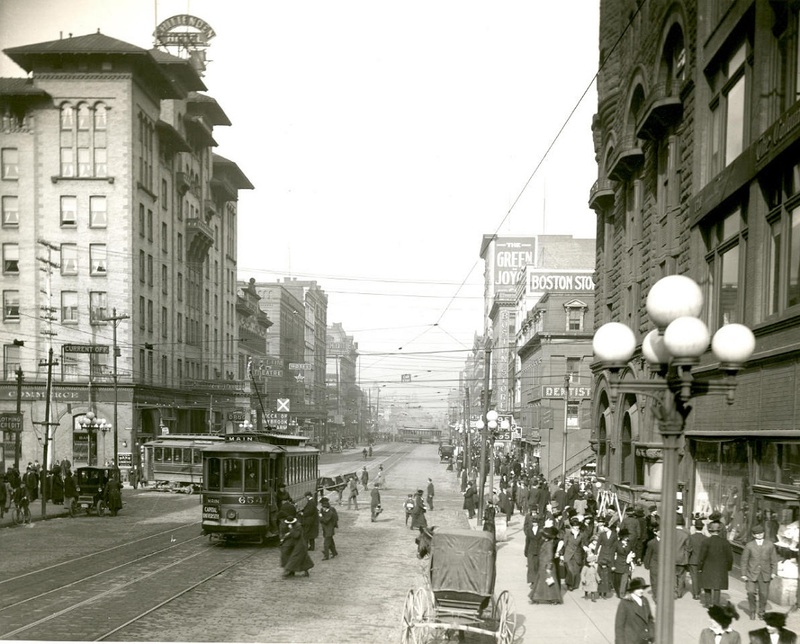 99 years ago, Downtown was truly a beautiful, vibrant place, and the present-day shots only serve to make the transformation all that much more awful. You have to wonder what people were thinking in terms of design and the way that they systematically destroyed the environment that made the city what it was. 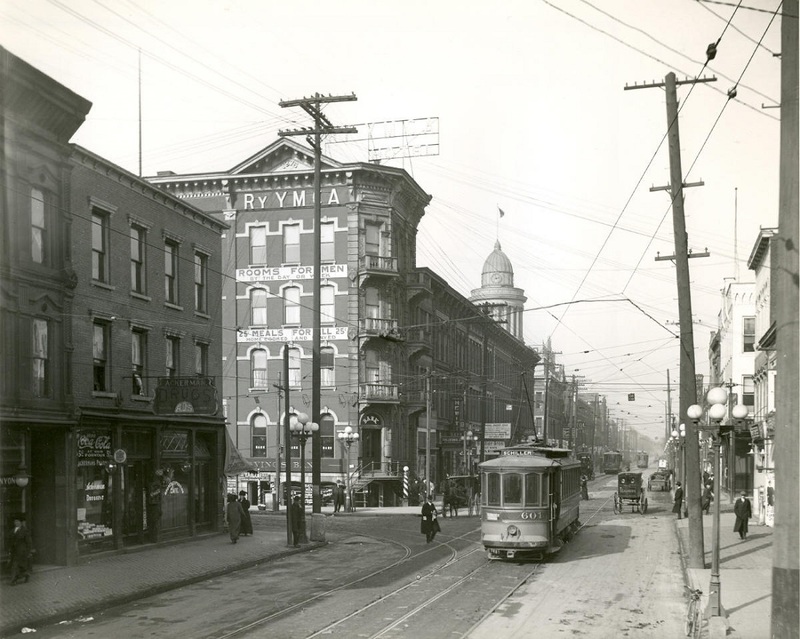 In any case, the photo set from 1914 was apparently taken by a photographer that walked the length of High Street starting from the intersection of Town Street all the way up to Goodale Avenue at the beginning of the Short North. 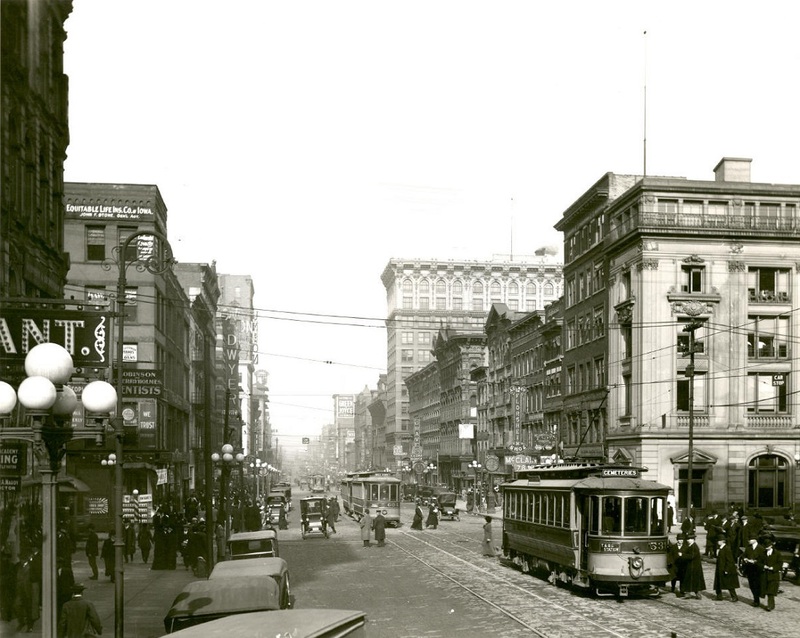 They are some of the best historic photographs I’ve ever seen of Downtown Columbus. Let’s begin the tour. Taken near the intersection of Town Street and High Street- 1914. The photo above at Town and High shows Lazarus Department Store on the left. It is one of the few buildings that remains today, as shown below. Town and High, present day. The next set is the before and after from Capital Square, just south of the Broad and High intersection. The tall building in the center of the photo is 8 E. Broad and one of the few still standing today. Capital Square in the present day. 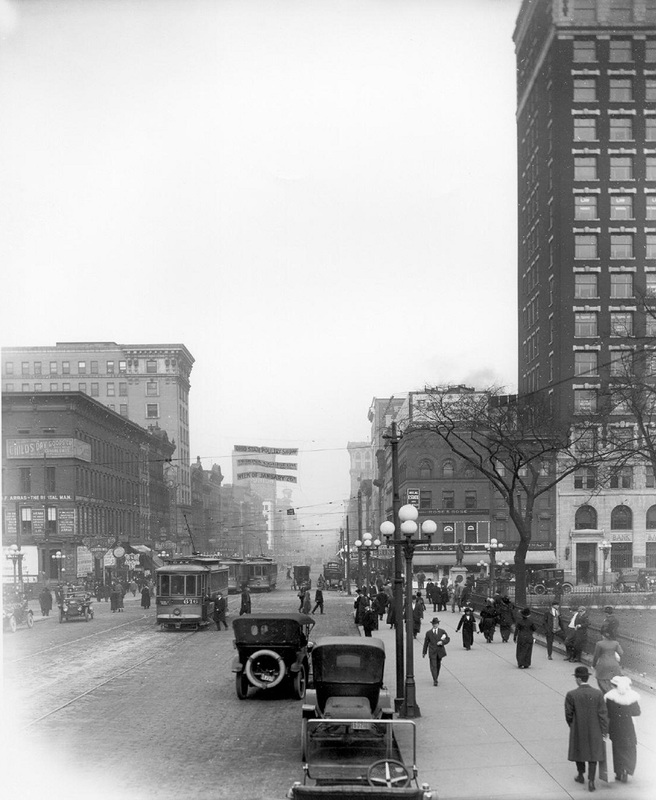 The next few photographs show the very heart of Downtown, the intersection of Broad and High. A few buildings remain, but most is gone. The intersection of Broad and High Streets. Next is High Street just north of Broad and looking north. Notice just how many buildings are gone. Up next is the intersection of Long and High, just south of the Atlas building (on the right). The Atlas Building still exists and is in the process of renovation. There are also a few buildings across the street that survived. Few others did. For the 2nd to last set, we have the intersection of Spring and High. The old Chittenden Hotel is the large building on the left with the Lyceum Theater behind it. Most of these buildings were torn down to make room for the Nationwide complex in the 1980s. There is literally not a single building from 1914 still standing in this area. And finally, we have the intersection of Goodale Avenue and High Street. This before and after shows a drastic transformation. Many of the buildings in the photo, including the building with the beautiful domed rotunda, were demolished to clear the right of way for the construction of I-670. Others succumbed due to the Convention Center’s construction or the Greek Orthodox Church’s expansion in the 1980s. There is only one point of reference to know this is the same place. If you look closely, just past the building with the rotunda and to the right, you can just make out the roofline of the Yukon Building. It is the first line of buildings to survive north of 670 and begins what is now known as the Short North. To me, this is the most tragic photo of all. Like so many cities, Columbus had incredible architecture in abundance, and the leaders in the middle part of the 20th century squandered it all away, leaving the current generation trying to rebuild a divided, empty shell of what once was. Much of it, however, can never be restored. Let it be a visible reminder that development has real consequences if not followed through wisely. 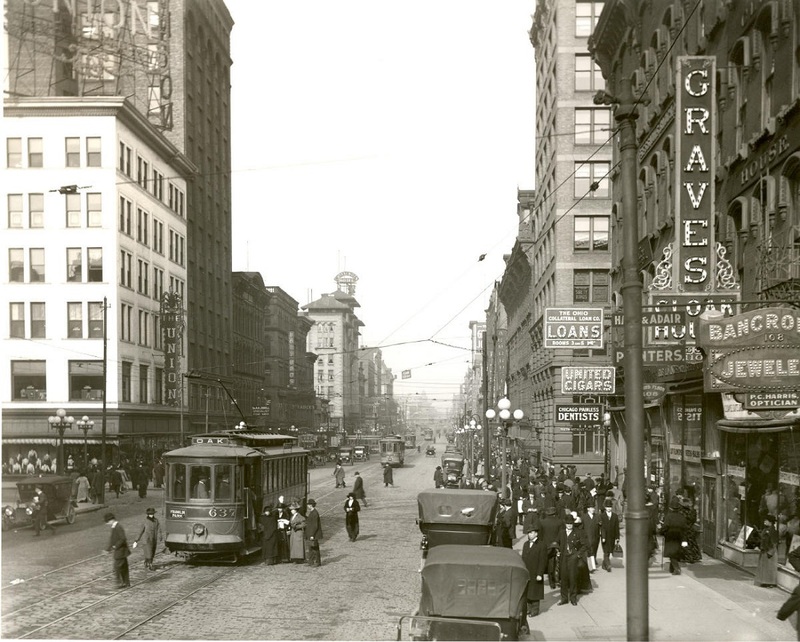 This entry was posted in Columbus City and tagged 1914, Before and after, Change, City, Development, Downtown, High Street, History by admin. Bookmark the permalink.